Libraries have changed so much in the last 15 years. I do remember my school library with regular chairs, desks, and those old traditional shelving units. In this point of time and generation, “libraries” are no longer called a library, people refer to them as “Learning Commons”. These Learning Commons are not only a flexible place to learn but also a place to connect with others. These spaces consist of various furniture pieces that adapt to the needs of every user. Ergonomic furniture, individual workstations, collaboration desks, everything is here for every individual to experience and to create a more fun and functional environment. Of course, Interior Designers had to incorporate technology into these spaces, especially for those who prefer to learn via the digital world. Organic, fun and flexible. The Pond is a collaborative table that can seat anywhere from two to ten people. Discover the Pond and the endless possibilities. Fjord lounge furniture embodies a sense of calm and well-being and responds to the distinct values of today’s libraries. 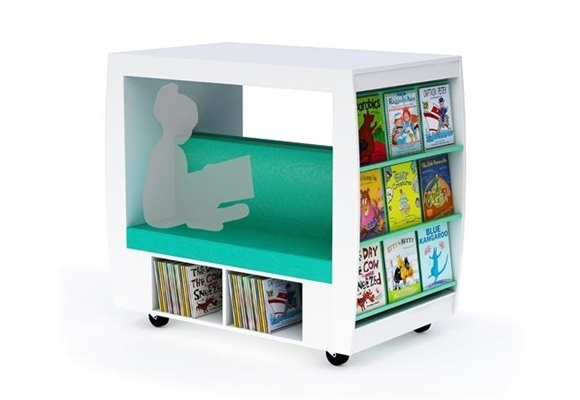 This library display unit will create an immediate “WOW” in any space. Perfect for promoting stock and encouraging reader development, this new collection has been specially designed to accommodate all types of media and ensure that your school, academic or public library is never short of dynamic displays. What furniture are you incorporating in your learning commons?